The annual Global Gypsum Conference is well-known around the world as the largest meeting of gypsum professionals and as the must-attend gypsum event. The conference in 2018 will meet in fabulous Vancouver and will appeal to gypsum and wallboard producers from around the globe. Strong delegate groups are expected to attend from the Americas and from Asia, as well as from around the rest of the world. Gypsum moisture varies depending on the source of its deposit (e.g., sea water, volcanic vapors, industrial byproduct, etc.) and the requirement of its final application or product (e.g., agricultural soil amendment, gypsum wall board, concrete, etc.). Because mined and industrially produced gypsum are both water soluble, gypsum’s moisture content must be monitored and controlled during the production process to ensure its usability. To monitor and measure gypsum moisture in the industrial environment, MoistTech developed, with the input of our mineral industry partners, the IR-3000 near infrared (NIR) online moisture transmitter. 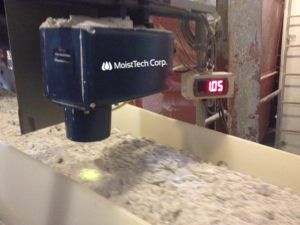 Capable of capturing thousands of measurements per second, the IR-3000 allows you to not only monitor the moisture content of gypsum, but also control it, by adjusting the production process, in real time. The IR-3000’s sensor provides instant, non-contact measurements of nearly any product or raw material. It is unsurpassed in the industry for quality, performance, and reliability.